In the rapidly changing Central District neighborhood of Seattle, signs posted on privately developing lots have become ubiquitous. The Coming Soon Series is a temporary installation in dialogue with these signs, writing Black futures into the story of Seattle. 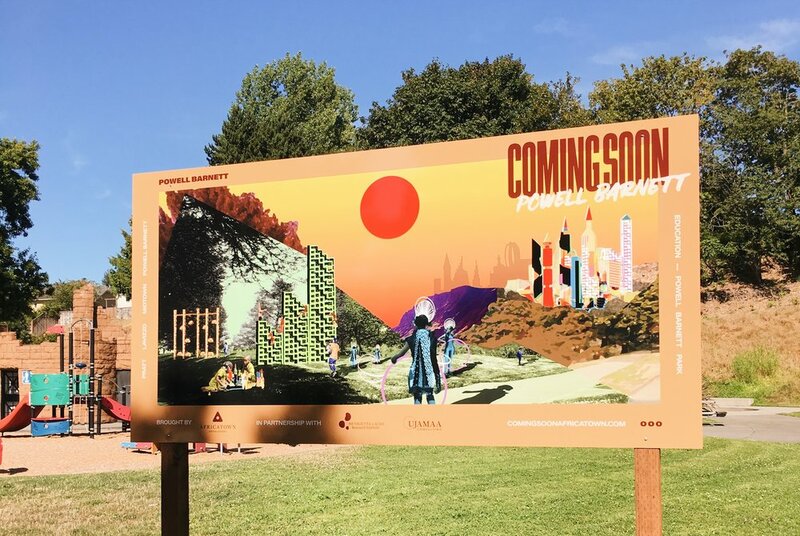 Fanstastical renderings of future potential developments, inspired by dialogues with community members and an Afro-Futuristic sensibility, were installed during the summer of 2018 at parks around Seattle's Central District. The satire was enhanced by creating a multitude of partnering companies, each with their own logo, inspired by African and African-American history. The creation of a satirical Black-owned real estate development firm, complete with its own website and social media, allowed the project to be viewable digitally, and provided a platform to connect with a broader range of the community.